In the recently published open-access article in Ecosphere we studied the influence of fluvial network topology on different measures of amphipod diversity. The scientific novelty is the distinction between native and non-native species within a single taxonomic group in a large and natural system. 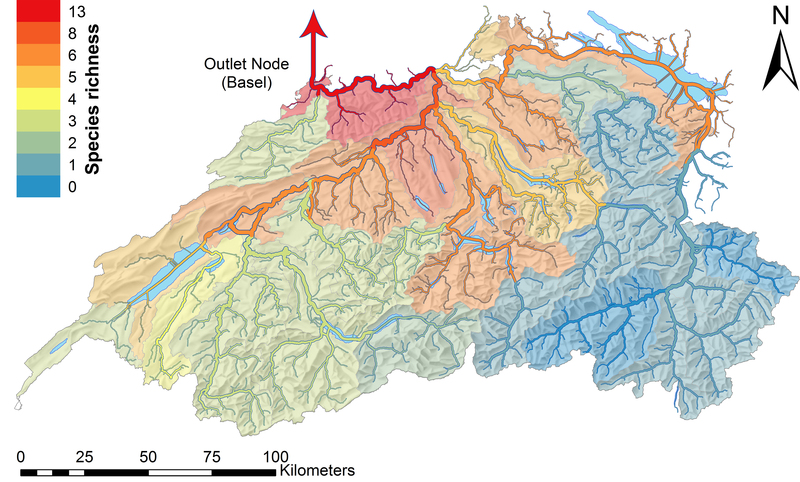 The study covers the 27,882-km2 drainage basin of the river Rhine in Switzerland and is based on a graph theory approach. As hypothesized, species richness increased along the network from headwaters to the outlet nodes. But native and non-native amphipod showed different patterns, with headwaters being refugia for native species and more downstream nodes being hotspots of biological invasions. Additionally, results from species turnover indicated a much lower dispersal limitation for non-native species. The amphipod community structure closely mirrored the topological modularity of the network. Our results highlight that connectivity plays an important role in community formation, also on a larger scale. Rivers and streams are essential in explaining biological invasions.